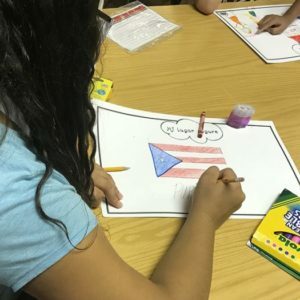 More than 40 children who were displaced by Hurricanes Irma and Maria and relocated to Eastern Pennsylvania were treated to a week-long Camp Noah program at St. Luke’s Lutheran Church in Reading in August. Lutheran Congregational Services, an affiliate of Liberty Lutheran Services, helped coordinate the program, which included volunteers from many non-profit and faith-based organizations in Eastern Pennsylvania, including Upper Dublin Lutheran Church. Camp Noah aims to help children affected by disaster heal from the trauma of being displaced and relocated through a variety of fun, creative activities focused on themes to build and reinforce specific resiliency skills. Each day, breakfast and lunch will be provided by volunteers and children will take part in puppet shows, skits, crafts, music making and more.